Thinking about your own funeral is never easy, however putting a pre-paid funeral plan in place can spare loved ones from difficult decisions and financial worries during an emotional and stressful time. Average funeral costs have risen significantly over the last decade and are expected to rise even further so it really makes financial sense to consider a pre-paid funeral plan. 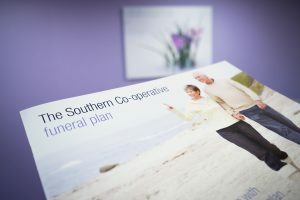 The Southern Co-operative Funeralcare plans are guaranteed at today’s prices. Regardless of how much prices may rise over time, there will be no hidden costs or additional fees when it comes to using the plan, whether that be in five or 50 years’ time. It’s not just about the cost of the funeral; there are other important planning considerations to make it a unique and personal occasion. Tailor-made plans enable you to organise every aspect of the day, from the location of the service and the floral tributes, to the choice of music played and the stationery used. The Southern Co-operative offers a wide range of personalised picture coffins, including designs incorporating personal photographs or imagery of favourite pastimes and hobbies. A popular choice is the eco coffin collection, providing an attractive and environmentally friendly alternative to the traditional coffin. You could choose a natural woollen coffin from the beautiful Hainsworth range, hand constructed using pure, new British wool and lined with organic cotton. A variety of transport options are available including Harley Davidson sidecar hearses for the motorcycle enthusiast, Volkswagen campervan hearses for retro fans and Rolls Royce Phantom hearses for those who prefer the luxurious touch. With so many choices and decisions to make, the dedicated and knowledgeable Funeralcare team can help you create a plan that meets your needs and budget. They can also set up monthly payments to help spread the cost from one to five years. The team are happy to arrange a mutually convenient time to meet with you, whether that’s in the comfort of your own home or at your local Southern Co-operative Funeralcare home. Further information on pre-paid funeral plans | Contact us to discuss your requirements in further detail.